Balance Changes. Japanese Cruiser Zao and Destroyers Firing 100m HE Shells. For the Japanese HE shells of 100 mm caliber (used on Akizuki, Kitakaze, Harugumo and secondaries of the Zao and Hakuryu), the armor penetration parameter was increased from 17 mm to 25 mm. 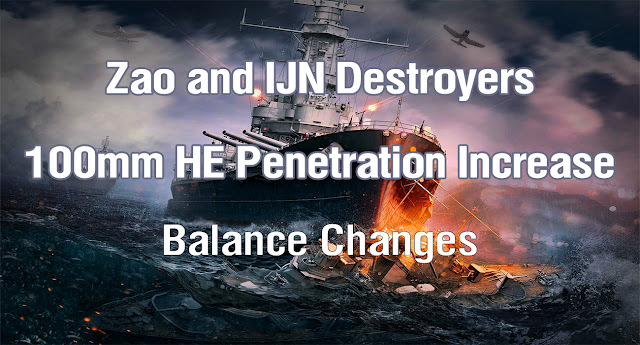 This change will allow the HE shells to penetrate the armor of all destroyers, except for Khabarovsk. The rudder time for the Hull (A) is increased from 6.5 to 7.8 s.
Maximum Speed was increased from 33 knot to 36 knot to increase the level of comfort of the game on the ship.